Life was very different for the Lux Serech family 27 years ago. Newly married and expecting their first child, Joaquin Lux de la Cruz and Mirian Lux Serech had few resources. Joaquin worked as an assistant to a mason, and Mirian washed clothes by hand. When Joaquin and Mirian were children, they did not go to school. They worked to support their families. Joaquin was one of eight children. His family lived in a metal home with dirt floors in San Miguel Pochuta near Chimaltenango, where they cleaned and sorted coffee for work. Four of his siblings died in childhood from untreated illnesses. They did not have a car or money for the bus to go to the doctor. 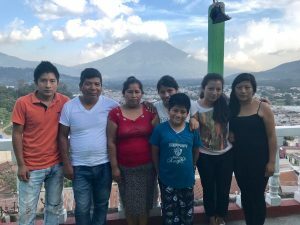 Joaquin’s family and 12 other families moved to Jocotenango when the coffee farm owners acquired a new coffee farm, Bella Vista, on the hillside in Vista Hermosa. Mirian’s situation was similar. She was one of 10 children in her family. They lived in Jocotenango and, like Joaquin’s family, worked for Bella Vista coffee farm. Her dad was an alcoholic and frequently used the family’s money to buy alcohol instead of food. 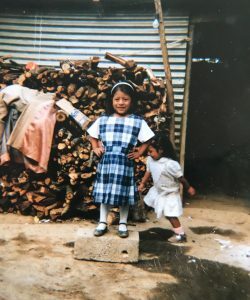 Lucrecia and Maria play in front of their first family home 22 years ago. Their new house is on the same piece of land in Vista Hermosa. Mirian and Joaquin met at the coffee farm and moved into Marian’s mother’s home after they were married. In 1993, they earned enough money to buy land on a cliff in Vista Hermosa, a district in Jocotenango. After clearing and leveling the land, Joaquin built a home from six pieces of lamina, or sheet metal, and bamboo. The home had dirt floors, and they cooked over a smoke-producing wood stove. Yet, despite the difficulties, Joaquin and Mirian began to save money and hoped for a different life for their children. Saving money is not commonplace in Guatemala. When money comes in, the tendency is to spend it immediately. The lack of savings perpetuates the cycle of poverty for generations. Joaquin took a counter-cultural approach when he would tuck money away, “poco a poco” (little by little). With the savings he purchased materials for the home, which sometimes meant buying one cement brick at a time. Maria, 24, and Lucrecia, 25, stand in front of the two-story family home their father built by hand. Joaquin worked on their house early in the morning and late into the night, before and after work. He started with a simple cement structure and later added divisions for rooms. The house evolved over 25 years. The structure now stands two stories tall with a fully operational kitchen, four bedrooms, dining room, bathroom and entryway. Joaquin built the entire house by hand. Joaquin and Mirian received praise for their success, but also were subject to jealousy from some of their neighbors. Instead of letting the negative talk influence their life, they share their story and encourage others to work for change in their own lives. Joaquin Lux de la Cruz never thought all of his children would graduate. He now has pictures to prove it. The Lux Serech family home is a representation of the decisions Joaquin and Mirian made to break the cycle of poverty. Along with savings, education is a critical component of socioeconomic status in developing nations. When children complete school, they are able to find better jobs and contribute to the household income. 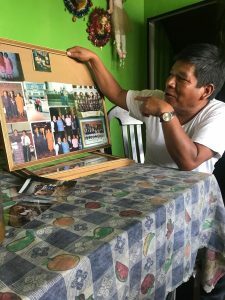 Joaquin and Mirian stressed the importance of education with all of their children, eight of whom attended or presently attend Escuela Integrada. Irma, 27, Lucrecia, 25, Maria, 24, Luis, 23, Joaquin, 21, all graduated from Escuela Integrada and, later, from high school. 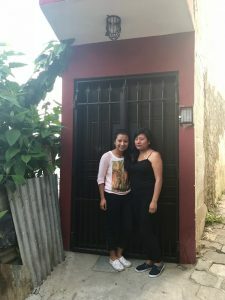 Irma is employed as a bilingual secretary, Lucrecia graduated as a bilingual secretary but has not found work, and Maria is studying to be a teacher. Luis and Joaquin studied digital electronics and are currently searching for work. Yennifer, 18, went to a nearby school and will graduate from high school this year, as will Juan, 17, who attended Escuela Integrada. The youngest two children in the family, Julio, 14, and Brayan, 11, are current students at Escuela Integrada. The second story of the Lux Serech family home rises above Antigua with a view of the Agua Volcano. Today, Joaquin and Mirian pray for work for their children and hope that their children will always have what they need. They tell their children to respect all people and to see them as equals in the eyes of God. To learn more or to support the education of children like Irma, Lucrecia, Maria, Luis, Joaquin, Yennifer, Juan, Julio and Brayan, visit www.wearegraces.org.